"Noah St. John’s work is about discovering within ourselves what we should have known all along — we are truly powerful beings with unlimited potential." Your subconscious belief system is STRONGER than your goals, your drive… even your actions! You won’t find this life-changing instruction anywhere else. Promise. Or get ALL your money back! YES, I want to be overflowing with self-confidence at work, home… always. And I want to achieve the kind of money, relationships, success, and lifestyle that come by having ultimate self-confidence. 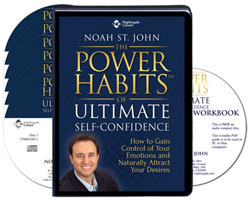 Please send me Noah St. John’s NEW 6-CD audio program The Power Habits of Ultimate Self-Confidence PLUS DVD and Writable Workbook on CD for $99.95 which is $40 off the regular retail price. If within 30 days, I’m not more self-confident and seeing more results in my life, I will simply send the program back for a full refund. No questions asked.